The internet has expanded our Atari hobby in near limitless ways. Not only can we connect our Atari home computers to the internet but we can access tons of software, magazines, books, and web pages that enhance our experience. A number of my posts to this web page take advantage of online materials and resources. One of the most important Atari resources is the Internet Archive that was founded more than 20 years ago. This is an amazing resources that is archiving music, photos, software, tweets, documents, images, web pages, podcasts, books, etc. Of course, there is also tons of Atari stuff. A search on the word Atari yields more than 26,000 entries. This resources is well worth your time to explore. Here are just a few examples of Atari stuff on the archive. The goal of this project is to contribute Atari items you might have to the internet archive. The more we all add to it the more useful it will be to Atari enthusiasts. 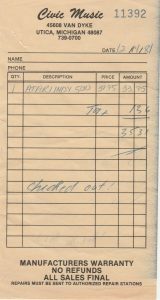 I looked through my Atari items and found this receipt from 1981 for the purchase of the Atari 2600 game Indy 500 from a store in Michigan. This is not my receipt. Rather, I received it in a lot of manuals. The receipt is likely to one of a kind so I decided to put it on the archive. Posting to the Internet Archive is relatively easy. I tried it for the first time for this post. Create an account on the Internet Archive. It is free! Once you have an account click on your user name on the right side of the top menu bar and choose “My Library”. If you have Flash enabled on your browser you can drag and drop the file you want to upload in this screen. If you don’t have flash you will you need to upload using a slightly more complicated method. For this, click on the upload text, enter the title, description, and some other info on the next page. Press the “Share File” button at bottom of page. Clink on the link provided on the next page. This should bring you to the Internet Archive Item Editing Tool page with a blue banner. Click on the “Tree Root” folder icon and then click on the “File” button right above it. This will bring down a menu. You can “Add” and then “Upload” your file at the bottom of the menu. Scroll down and push the blue “Update Item” button. You will then get a screen that says “A “derive” task will be run on your updated item in 15 minutes…”. You can push the start button there to speed this along but you need to wait some time until the derive process is finished. Sheesh! Click on the link at the top of that page and this will take you to a page where you need to choose what kind of file you are uploading. This goes into the meta data. Once your files has been “derived” you should come to the meta-data page. Enter as much as you can. Most of the fields are self-explanatory although some seem locked from editing. Not sure why. When you are done hit submit and your files should be public within a few minutes! Posting to Internet Archive is a worthwhile thing to do. You never know whether that seemingly unimportant item you post might be key to a historian or someone doing research. The interface is not highly intuitive but it is functional with a little patience. While making this post I uploaded a second item. Here is an Atari users group letter from 1985 that I found in my files from back in the day. This letter was addressed to my father who I think was trying to track down users groups in Illinois. Happy posting!